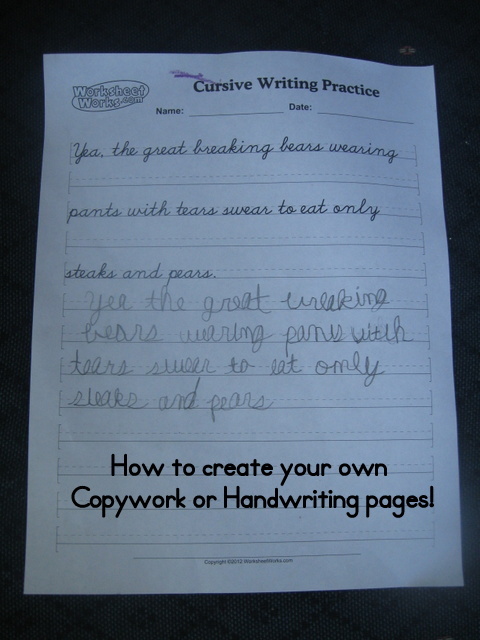 A friend asked me today if I knew of a website to easily create custom copywork pages with traceable letters. I knew I had heard of one, but I didn’t have it bookmarked. A google search revealed that Worksheet Works has a free handwriting practice sheet generator with options for both print and cursive writing styles in either solid or dashed text. I haven’t tried it yet, but I think it’s exactly what my friend was looking for! I’ve always made custom copywork or handwriting practice pages using either Microsoft Word or Microsoft Publisher. There are several free printing and cursive handwriting fonts. Check out this page at about.com and this listing at fontspace.com for several options. One aspect of making a practice sheet in Word or Publisher that always befuddled me a bit was creating the blank lines below or next to the text as a space for doing the copying. The best I was able to come up with copying a free blank handwriting page into the file as a picture or graphic. This was a clunky solution but better than nothing. This post at HSclassroom.net alerted me to a better solution. Some handwriting/penmanship fonts (including one I had installed, penmanship print), include a blank rule, accessible by using the ` key (this is the symbol below ~, in the upper left of your keyboard). Brilliant! I also learned a new trick from reading this thread at the Well-Trained mind forums — in Word, type several asterisks in a row like this *****, and then hit enter. You’ll get a nice dotted line that extends across your page. This might come in handy for certain handwriting situations as well! Finally, if you are looking for a more fully-featured custom copywork or handwriting solution, many people seem to like StartWrite. I haven’t tried this software, but from a brief look at their website, I see it includes many neat features like fancy borders, colored text, easy-to-insert graphics, start-point dots, and more. This software will run you $24.95 or $39.95 depending on which version you select. I haven’t made many copywork or handwriting sheets lately — Mr. E is just getting to the point of more interest in writing, and Miss M gets a lot of cursive practice with her “Reason for Handwriting” workbook. I also hadn’t yet installed a cursive font that I was really happy with. But doing this research for my friend has given me renewed interest in doing this! Check out Copycat Books http://www.copycatbooks.com for lots of copywork pages (e-books) to download and print out. Manuscript and cursive, biblical and academic themes, 3 popular handwriting styles (traditional, modern, and italic). Lots of free printables, too. The e-books were created using the true-type fonts from Educational Fontware that can be used in Word.